With a 4×4 vehicle you can travel up to Jebel Sham (“Mountain of Sun”) located in north eastern Oman north of Al Hamra town. It is the highest mountain of the country and part of the Jebel Akhdar range, which in turn is part of the Hajar Mountains range. It is located 240 km (149 mi) from Muscat. In the summer, temperature is around 20°C (68°F) and in the winter it drops to less than 0°C (32°F). There are spectacular views of Wadi Nakhr (the “Grand Canyon” of Oman) – the largest canyon in Arabia. There is an excellent trek around the rim of the Grand Canyon for the more adventurous visitor! As you approach the Grand Canyon via Wadi Ghul you can make an interesting and exhilarating diversion up Wadi Nakhr, leaving you vehicle and walking up the canyon, surrounded by the extremely steep and stunning sides of Wadi Nakhr. 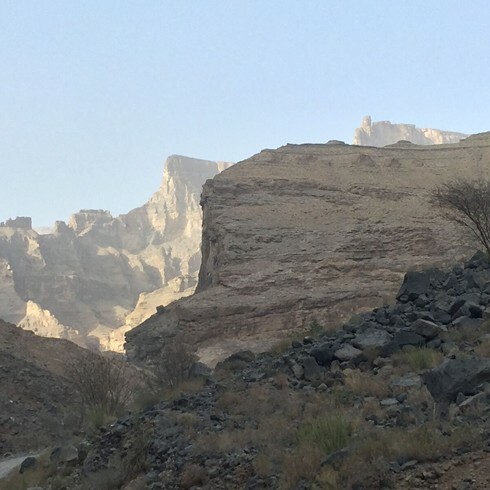 Again with a 4×4 vehicle you can drive up to Jebel Akhdar (the “Green Mountain”), part of the Al Hajar Mountains range in Oman, which extends about 300 km (186 mi) northwest to south east, between 50–100 km (31–62 mi) inland from the Gulf of Oman coast. It is one of Oman’s most spectacular areas. The range is mostly rocky desert, but at higher altitudes it receives around 300 mm (12 in) of precipitation annually, moist enough to allow the growth of shrubs and trees and support agriculture. It is this that gives the mountains their 'green' name. Cool summers provide the visitor with fresh air surrounded by breath-taking stones. 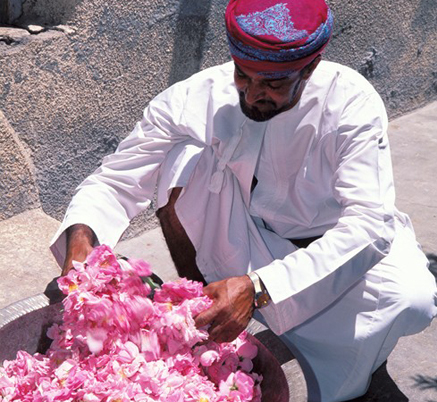 The area is about a 45 minute drive from Nizwa and is famous for its traditional rose water extraction and agricultural products including pomegranate, apricot, peach and walnut. The Jebel is mostly inhabited by the ancient Arab tribe Bani Riyam (al Riyamy). Most descendants of the tribe are now in nearby towns such as Nizwa and Izki. Between 1957 and 1959, the area became a site of the Jebel Akhdar War, a conflict between Omani forces loyal to the Sultan of Oman (aided by British soldiers, including the Special Air Service) and Saudi Arabian-backed rebel forces of the inland Imamate of Oman. 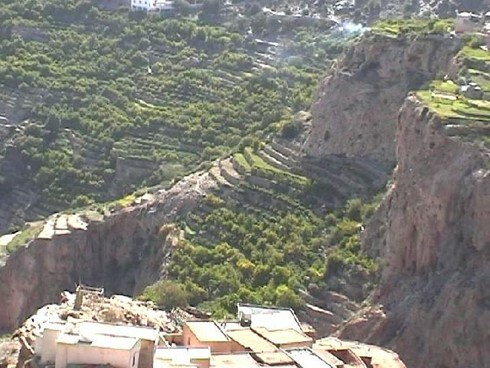 In August 2011, Sultan Qaboos designated Jebel Akhdar a nature reserve in a bid to conserve its unique yet fragile biodiversity. A decree issued by the Royal Court established the ‘Jebel Akhdar Sanctuary for Natural Sceneries’. Since 2011, the mountain has featured as the principal climb in the Tour of Oman road bicycle race. We strongly recommend staying at the Alila Hotel, a beautiful boutique hotel in a stunning location on the side of the mountains. 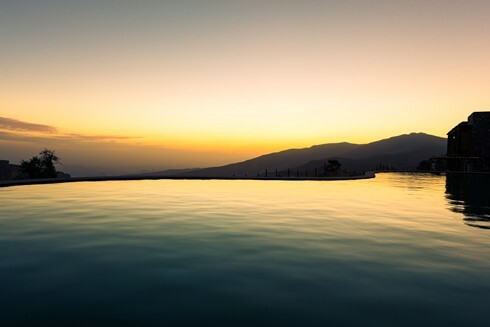 There is a heated infinity pool overlooking Jebel Shams! Accommodation is in well-appointed, comfortable and tastefully designed rooms, suites and villas. Dining at the hotel is in the Juniper Restaurant, a splendid, licensed eating place. 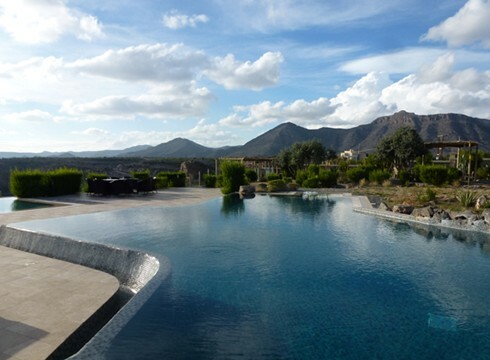 There are amazing views of the mountains from the terrace and gardens. Alternatively the Sahab Hotel, a smaller boutique hotel is also in a great location on the Saiq Plateau. The hotel garden is designed around countless beautiful fossils. The Anantara Hotel is due to open in June 2016. This is also situated on the Saiq Plateau near to the Sahab Hotel. There will be 82 canyon view rooms and 33 private pool villas. We will update information on the Anantara once it has openend and we have had a chance to inspect it. Whilst on the Saiq Plateau you should visit the villages of Al Aqr, centre of the desert rose growing area and Bani Habib, both with spectacular views.